Stay at Lenymede bed and breakfast and you are within easy reach of hundreds of kilometers of cycle tracks throughout the Trossachs. 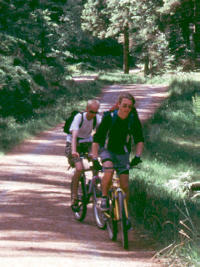 In particular the Queen Elizabeth Forest offers safe off-road biking through the Trossachs forests including both flat easy cycle routes and steeper, more strenuous ones for the experienced mountain biker. Lenymede Bed and Breakfast is a Victorian house offering quality Bed and Breakfast accommodation in Callander, the Trossachs, Scotland. Lenymede B and B is a family run friendly bed and breakfast in a beautiful house offering pleasant and relaxing accommodation. This web site gives detailed information on the accommodation at Lenymede Bed and Breakfast and an extensive tourist guide to Callander and the Trossachs with information on outdoor activities including cycling and mountain biking.